During 2018, Russian specialists conducted assembly and testing of the Spektr-RG X-ray observatory in preparation for launch in the following year. 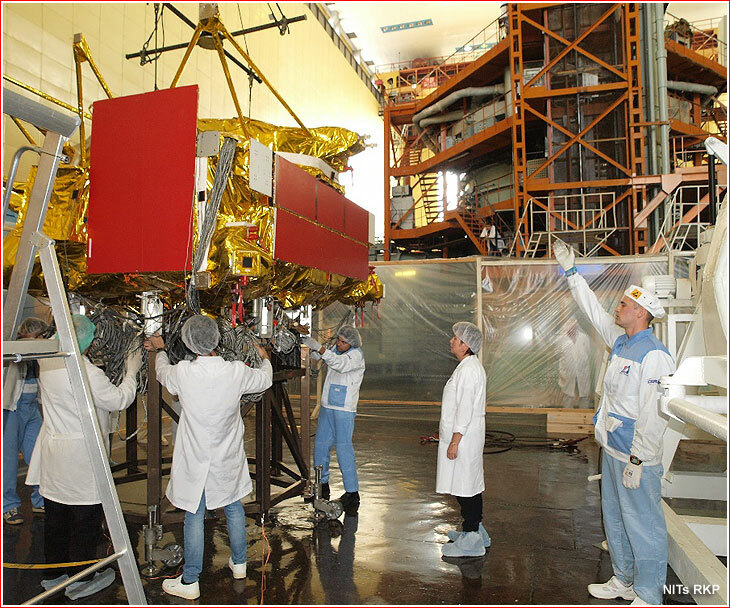 Personnel from NPO Lavochkin lifts the Navigator service module for the Spektr-RG mission during vacuum chamber testing at NITs RKP in Peresvet circa September 2018. On April 19, 2018, the press-service of the RKS Corporation said that it had delivered the Spektr-RG's radio system, BRK, and that the launch of the space observatory would occur in March 2019, even though, accumulated delays already pressured the launch toward the end of the first 2019 window at the beginning of April 2019. 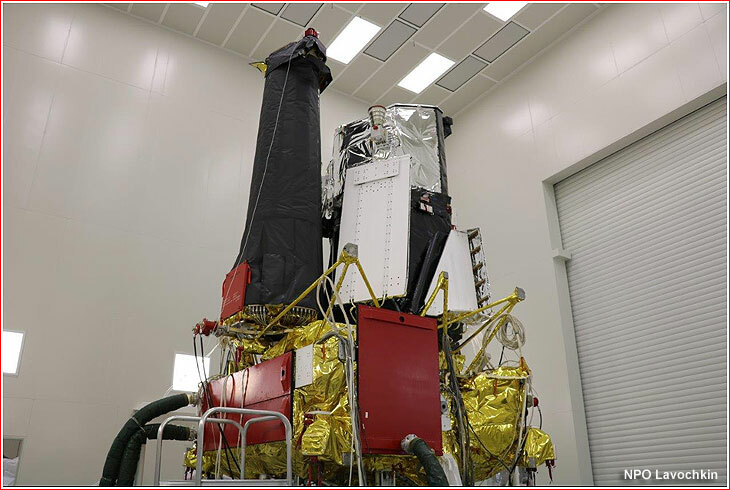 By the end of May, both operational instruments of the observatory -- the Russian ART-XC and the German eROSITA -- had been integrated with the flight version of the Navigator service module and tested. At the time, engineers were still working on a software update in the flight control system, BKU, of the spacecraft for handling the interface with the ART-XC instrument, industry sources said. On May 29, NPO Lavochkin announced that from May 3 to May 21, a joint team of its engineers and specialists from the Space Research Institute, IKI, in Moscow and Max Planck Institute in Germany had conducted electric tests of the flight-worthy onboard radio complex, BRK, integrated with eROSITA and ART-XC telescopes. According to NPO Lavochkin, the electric tests were necessary to check interaction between the service systems of the spacecraft and scientific instruments. The company also said that the spacecraft had been transferred to the assembly room and was a process of preparation for thermal and vacuum tests which had been scheduled to begin in July. In the meantime, on May 22, Roskosmos abruptly cancelled a routine status meeting of participants in the Spektr-RG project scheduled in Moscow just two days later on May 24. 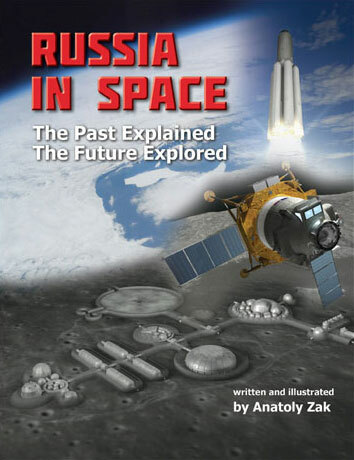 According to the official explanation sent to the German side, a letter from the German space agency, DLR, requesting the review had come too late for the Russian side to process for the given date. However, the Russian leadership of the Spektr-RG project unofficially informed their German colleagues that the cancellation might be related to another management shakeup at the top of Roskosmos. The sources familiar with the situation expressed optimism that the Spektr-RG had remained on track for its latest launch window at the end of March -- beginning of April 2019, still within the launch window extending from February 27 to April 11, 2019. Only on July 9, 2018, NPO Lavochkin announced that the joint Russian-German team, including representatives from DLR, Max Planck Institute, NPO Lavochkin and IKI met in Moscow to discuss the status of the project, in particular, the preparation of the spacecraft for thermal and vacuum tests. NPO Lavochkin said that according to a report from the German team, the integrated tests of the eROSITA telescope with the Russian radio complex had been successfully completed. Also, the IKI team successfully tested elecric interfaces between the ART-XC telescope and the spacecraft's onboard flight control complex, BKU. At the time, the launch window for the Spektr-RG was confirmed during the February-April 2019 window, NPO Lavochkin said. 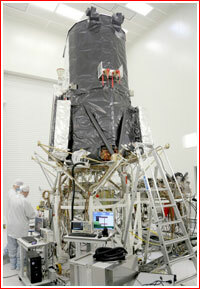 The Navigator service module for the Spektr-RG mission during preparation for the vacuum chamber testing circa September 2018. In a press-release dated September 9, the NITs RKP center in Peresvet announced that it had completed integrated electrical tests of the Spektr-RG spacecraft, though the components under testing included only the Navigator service module and the payload adapter sans its dual telescopes, which are the core of the mission. 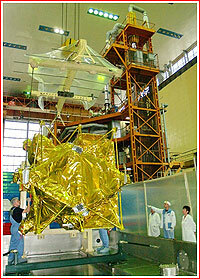 Accompanying photos showed the Navigator module wrapped in its thermal insulation inside the VK-600/300 vacuum chamber, which was previously used to test Spektr-R, Phobos-Grunt, Ekspress-MD2, Elektro-L1, Elektro-L2 and other spacecraft developed by Roskosmos. According to NITs RKP, the trials, which were a part of the demonstration and completion test program, had confirmed the operational capabilities of the spacecraft under the conditions approximating space, including near vacuum and low temperatures. The testing included checks of the main and backup equipment, service systems and a flight control exercise. 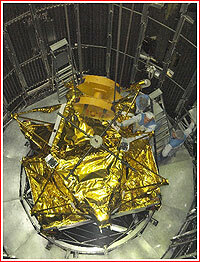 Upon completion of the test program, the spacecraft was removed from the vacuum chamber on September 9, NITs RKP said. 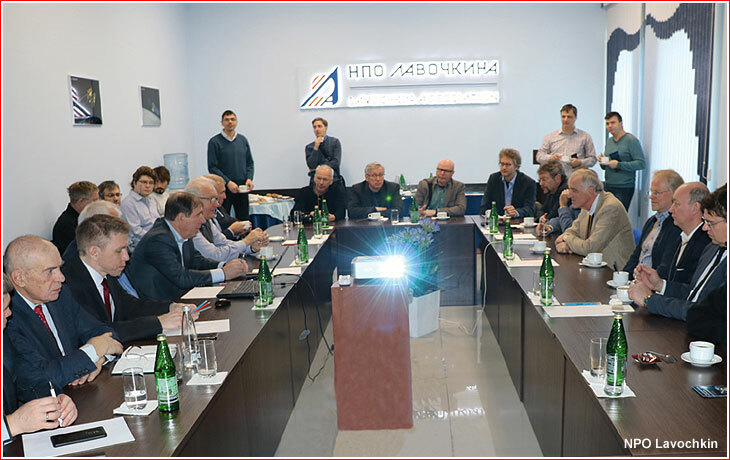 Members of the joint Russian-German team leading the Spektr-RG project held a series of meetings at the Space Research Institute, IKI, in Moscow from November 26 to November 28, 2018. Aleksandr Shirshakov, Deputy Designer General at NPO Lavochkin, chaired the event. According to NPO Lavochkin, the meetings confirmed the launch of the observatory during the Spring 2019 ballistic window extending from March to April. At the time, the spacecraft was undergoing integrated testing inside the clean room of the electric checkout facility, NPO Lavochkin said. However by the end of 2018, NPO Lavochkin had to plan the launch only at the end of the Spring 2019 window, either between April 1 and 2 or between April 12 and 13. 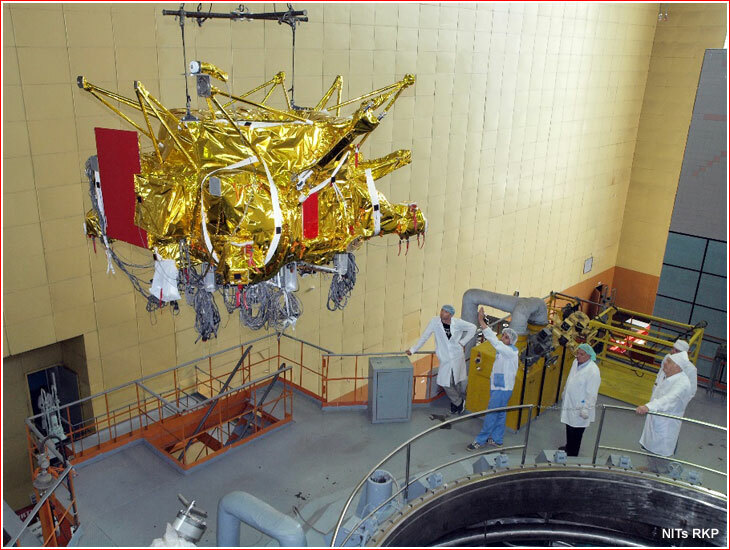 Flight version of the Spektr-RG spacecraft during integrated tests at NPO Lavochkin's clean-room facility in 2018.